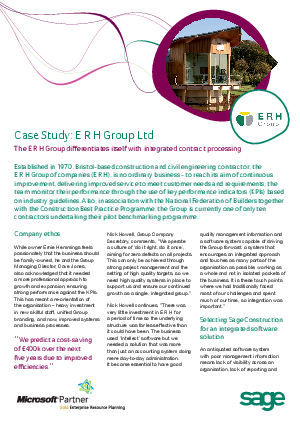 Established in 1970, Bristol-based construction and civil engineering contractor, the E R H Group of companies, is no ordinary business - to reach its aim of continuous improvement, delivering improved service to meet customer needs and requirements, the team monitor their performance through the use of key performance indicators based on industry guidelines. Also, in association with the National Federation of Builders together with the Construction Best Practice Programme, the Group is currently one of only ten conractors undertaking their pilot benchmarking programme. Download this whitepaper to learn more about selecting Sage Software for an integrated software solution, what it's like to partner with Sage construction and to find out what's next for the E H R Group.